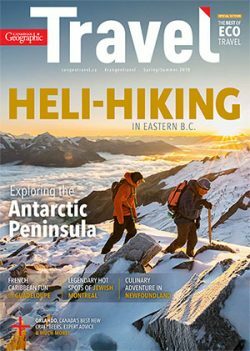 Dominated by towering mountains and craggy coastlines, Canada’s westernmost province is so geologically diverse that the nature hot spots found here are nothing less than abundant and varied. 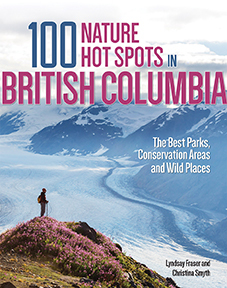 British Columbia is home to not only the driest, hottest place in Canada (Osoyoos) but also the wettest (Prince Rupert). From saltwater marshes to dry grasslands and coastal temperate rainforests to alpine tundra, the province’s diverse climate and topography host an incredible array of life. All of this translates to a province so naturally rich that there is something for everyone to enjoy. To protect it all, British Columbia has established the most extensive park system in the country, encompassing seven national parks, over 1,000 provincially protected spaces — which include parks, conservancies and ecological reserves — and countless regional parks and protected areas managed by local conservancies, land trusts, landowners, First Nations and volunteer organizations. Here are five fascinating spots to discover on your next adventure in British Columbia. What makes this spot hot? Tidal pools are home to extremely diverse varieties of species. 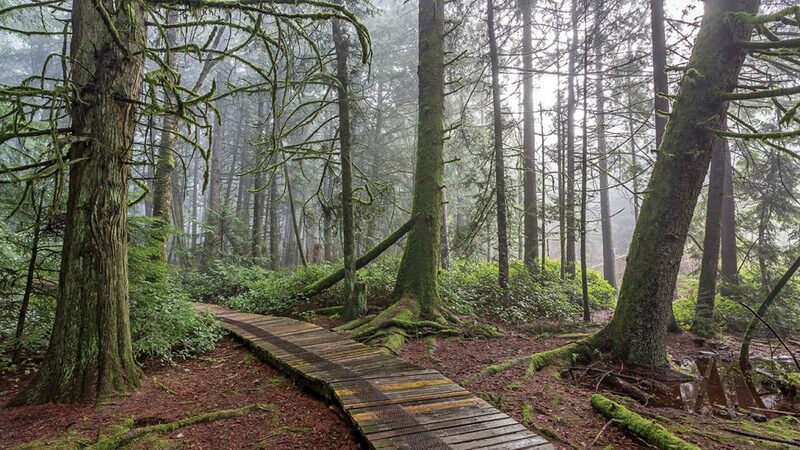 To reach the beaches visitors can walk a beautiful temperate rainforest trail loop, which also connects to the Juan de Fuca Trail. There are opportunities to see marine mammals, such as orca whales, grey whales, seals, sea lions and otters. A short walk through coastal temperate rainforest, a beautiful experience in itself, will bring you to the perfect spot to experience the diverse marine life of the Pacific Northwest. 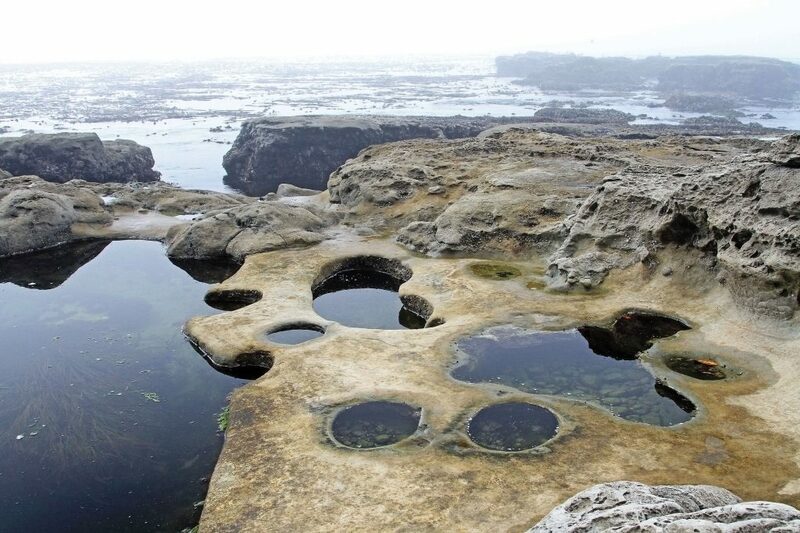 Protected within the boundaries of Juan de Fuca Provincial Park, Botanical Beach is the ideal spot for exploring the rich intertidal zone, the area that lies between the highest and lowest tides. Botanical Beach is home to an abundance of life, so expect to see multiple species of crabs, snails, sea anemones, limpets, barnacles, sea urchins, mussels, chitons, sea stars and brittle stars, as well as the occasional nudibranch or sea cucumber. The crystal-clear tidal pools allow for perfect viewing, but take the time to carefully examine each one — you will be surprised at what comes to life. 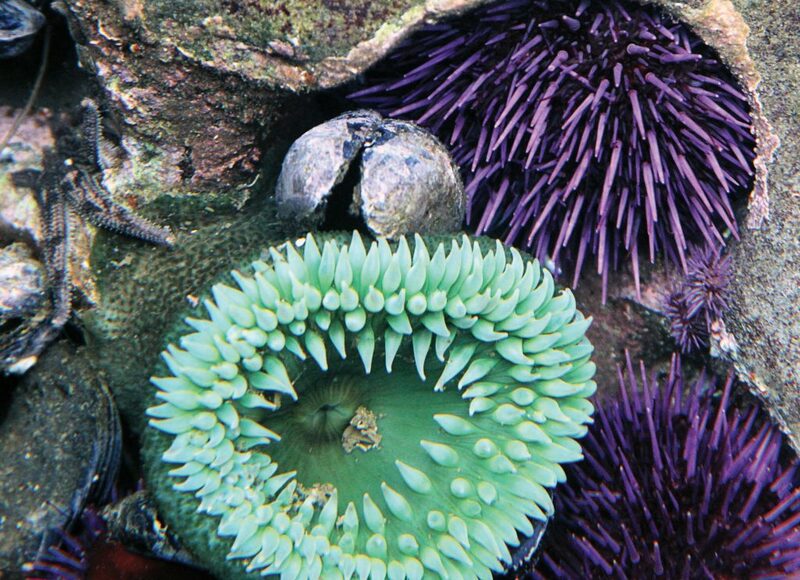 An unassuming snail shell may be home to one of several species of hermit crab, and giant green anemones may be seen using their stinging tentacles to catch a meal. The marine life is fragile and the rocks can be very slippery, so step thoughtfully — delicate snails, limpets, barnacles and other amazing creatures inhabit most surfaces, carefully enclosed in their shells to avoid desiccating while waiting for the tide to return. Plan your trip with the tides in mind, arriving at least an hour before low tide for time to explore the entire stretch of this family-friendly shoreline. The parking lot of this popular spot fills up quickly, so arriving early in the morning is best. Botany Bay, an adjacent beach accessible from the same trail loop, is also worth a visit for beautiful views of rugged cliffs and the black basalt shoreline. While the intertidal life is well worth the trip on all but the coldest days of the year, the area also offers opportunities for large marine mammal sightings — California and northern sea lions can be seen during the summer months, and harbour seals and river otters are also frequently spotted in the area. It is not uncommon for these shores to be visited by orca whales or even grey whales as they migrate north up the coast between March and April. The area is a key nesting habitat for the greater sandhill crane. It is home to regionally rare species, including Pacific water shrews, southern redbacked voles and painted turtles. Extensive peat bogs like this one act as carbon sinks, absorbing and storing large amounts of carbon. Burns Bog is the largest undeveloped urban landmass in North America. At 3,000 hectares, its area is eight times that of Stanley Park, and it is a vital habitat in the Lower Mainland. Over 2,000 hectares are inaccessible to the public, protected as the Burns Bog Ecological Conservancy Area, but nature enthusiasts can still explore this special bog habitat by visiting the Delta Nature Reserve on the eastern perimeter of the bog. Raised boardwalks allow for great views of the bog and forest, but the area often floods, so come prepared for wet weather and a flooded walking path. A vital stopover for migrating birds, the bog is an especially fabulous birding destination in the spring, but there are significant birding opportunities year-round. Burns Bog provides habitat for locally rare birds — blue-listed species found around the bog include purple martin, green herons, and barn and short-eared owls. Keep your ears tuned for the bugling cry of the greater sandhill crane, which can be heard over 4 kilometres away. Most of the cranes pass through the area during migration, but the bog is also one of only a few nesting sites these graceful birds use in the Lower Mainland. Known for their dancing skills, sandhill cranes court each other using a fantastic display of leaping, bowing and flapping their outstretched wings while hopping and spinning. The red-listed southern red-backed vole was once believed to be extirpated from Canada until a population was discovered in Burns Bog in 1999. The Pacific water shrew, one of the world’s smallest diving mammals, is found nowhere else in Canada but southwestern British Columbia, and although in decline, this red-listed species calls Burns Bog home. BC’s southwestern population of painted turtles is also red-listed, so Burns Bog provides a critical habitat for the province’s only native freshwater turtle. This area is a wonderful spot for dragonfly enthusiasts, as it is home to species that are often difficult to find elsewhere in the Lower Mainland. Zigzag and subarctic darners are typically found in northern peatland habitat but can be spotted at Burns Bog, along with chalk-fronted corporals and yellow-legged meadowhawks. The sphagnum moss in the bog began accumulating thousands of years ago. In some areas of the bog the peat deposits are over 20 metres deep. This is where the classification of raised peat bog comes from, as the peat is raised above the groundwater table. Peatland is an incredibly important carbon sink, storing vast quantities of biomass that might otherwise be converted into carbon dioxide and methane — both greenhouse gases. Peat is often used for agriculture, or extracted for fuel or horticultural use, so protecting peatland like Burns Bog is not only vital to the biodiversity it supports but also as a critical carbon repository on a warming planet. There is a great chance of seeing mountain goats in the area. Horned larks nest in the alpine meadows. A beautiful tarn lake greets you at the top of the hike. Although Hudson Bay Mountain attracts most of its visitors in the form of sports enthusiasts exploring its snow-covered mountainside, this area is also a summer destination for nature lovers. As the drive to the ski hill already brings you to a high elevation, it is not too long before you are nestled in delightful alpine meadows after a short, but mosquito-dense, hike through the last stretch of the treeline. A small reflective tarn called Crater Lake is your destination: a charming little lake nestled in the amphitheatre-like cirque that was carved by a glacier long since melted. Watch for hoary marmots, which will surely be watching as you cross through exposed meadows. Plan your trip with the bloom times for alpine wildflowers in mind, and you will be rewarded with blankets of blue, pink, yellow and white flowers. Pink and white mountain-heathers carpet the area, each colour seemingly claiming separate parcels of land as its own. Look out for green false hellebore, forget-me-nots and Alaska violets along the trail. Sedums, like the western roseroot, can be found flowering well above the treeline, where moss campion also clings to the barren landscape. Of course, these plants are displaying showy flowers for a reason, and the harsh, exposed environment does not deter robust bumble bees. The large size and fuzzy bodies of bumbles help them retain heat as they travel from flower to flower collecting pollen in their baskets. Their meticulous work helps to ensure that wildflowers will bloom in the meadows for years to come. Horned larks are a highlight of this alpine adventure as their musical song can be heard ringing out across the meadow. In the summer keep an eye out for fledgling larks nestled low to the ground while they wait for an adult to return with food. Horned larks begin nesting as soon as snow-free patches appear in the meadows, constructing fine woven baskets to house their families. Sometimes females will create “pavings” beside their nests, a small collection of pebbles, clods of soil and other materials that resembles a walkway. This region is home to a healthy population of mountain goats that frequents the slopes of Hudson Bay Mountain between June and October, although the best time to spot them is August and September. 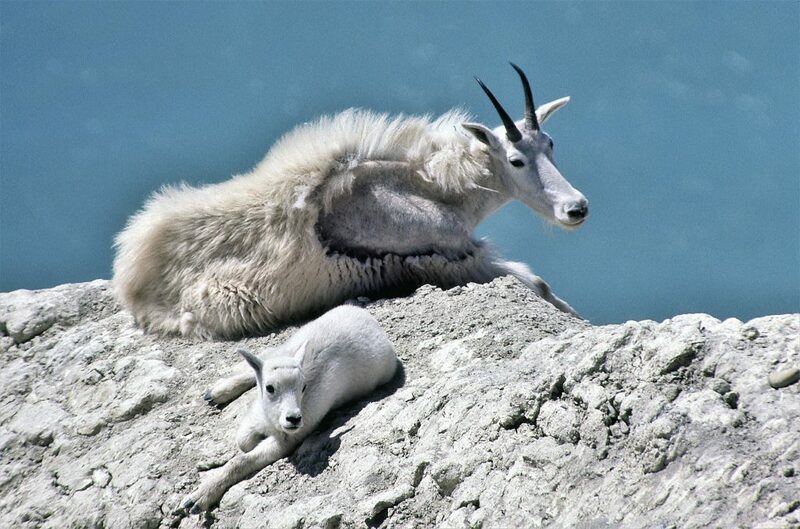 Among the world’s most skilled mountaineers, these agile ungulates usually stay close to cliffs so that they can make a quick escape up often near-vertical slopes to safety. Explore a landscape that, less than 300 years ago, was the site of a devastating volcanic eruption that buried villages and changed the area forever. Unique log moulds were created when molten rock cooled around the trunks of trees that were surrounded and toppled by the lava flow. This truly unique park elegantly weaves the natural and cultural histories of the Nisga’a Nation’s amazing land. Almost 300 years ago, a volcanic eruption burst forth from the Tseax Cone. As molten rock spilled from the crater, it covered everything in its path, including two Nisga’a villages, and tragically killed more than 2,000 people. Nisga’a Memorial Lava Bed Provincial Park (also known as Anhluut’ukwsim Laxmihl Angwinga’asanskwhl Nisga’a), which is co-managed by the Nisga’a people and BC Parks, remains a memorial site for those lost, an amazing opportunity to learn about the Nisga’a Nation and their history, and a chance to experience a unique nature hot spot. The expansive lava beds still dominate the landscape, providing an opportunity to investigate the slow and dramatic return of life to this harsh, barren landscape. Lichens were the first species to establish on the lava rock, encrusting the rough rubble. Over time the lichen growth thickened, and trapped leaves, dirt and debris built up in the crevices, allowing other species to move in. Although vast portions of the lava fields still only support lichens and a few tough, low-lying plants, areas near water sustain the growth of large trees and a healthy forest community. 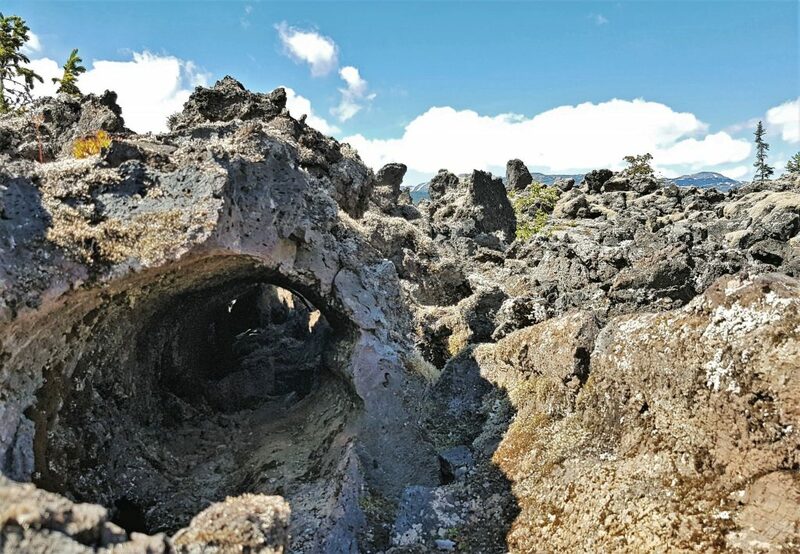 In some areas, the lava rock is 12 metres deep and buries the rushing waters of Lax Mihl (Crater Creek), which still flows through underground passageways. Beautiful falls found within the park are easily accessed through short, flat, well-maintained trails. Do not miss the opportunity to take in the breathtaking sight of white, rushing water hitting the calmer flow of a turquoise stream, surrounded by dense conifers and a moss-covered forest floor. Ksiluuyim Agiiy (Vetter Falls) is a stunning set of waterfalls where glacier-fed waters spill over a short ledge before continuing downstream. Among the most fascinating lava formations found in the park are log moulds. As the lava flowed across the landscape and destroyed everything in its path, it surrounded, toppled and burned large trees. In some cases, when the lava cooled quickly enough around a tree, it formed a mould of the tree. The trees burned or eventually rotted away, leaving dramatic hollow tubes on the landscape. This area is also a great place to examine some small but tough inhabitants of the lava beds. Three-toothed and spotted saxifrage root in the cracks, and the bubbly green and bright red leaves of spreading stonecrop form small mats on even lava. The Nisga’a call them lava berries for this reason. The only way to access the Tseax Cone is through a guided hiking tour, allowing for the protection of this important and sensitive area. Tours begin from the visitor centre, which is built in the style of a traditional longhouse with many interpretive displays on the history and culture of the Nisga’a. Make sure you also visit the impressive Nisga’a Museum, Hli Goothl Wilp Adokshl Nisga’a (“the Heart of Nisga’a House Crests). Here you become immersed in the deep roots and culture of the people, including the long, painful battle for a treaty that acknowledged their claim to this beautiful land they have always called home. Stargazers can search the night sky for constellations from the top of a mountain at one of the premier stargazing spots in Canada. From a viewpoint small, coloured pools give Kliluk Lake a spotted appearance during the summer. Visitors can hike through a protected ecosystem inhabited by rare desert plants. 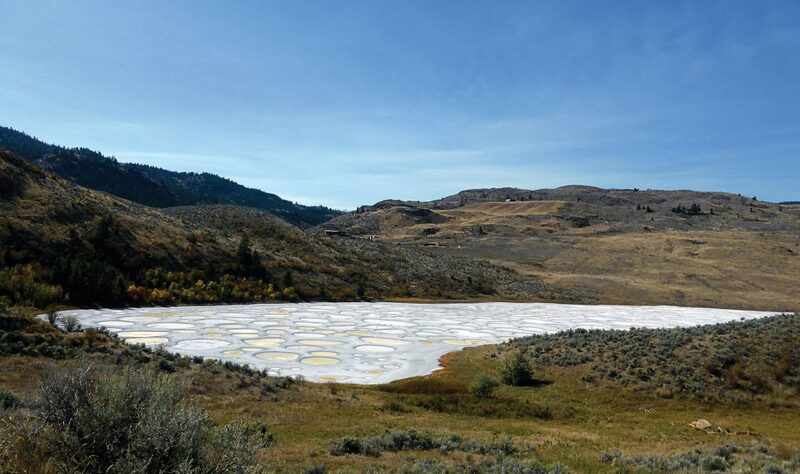 One of four sites that compose the South Okanagan Grasslands Protected Area, Mount Kobau is well known as a stargazing destination. A drive or hike up the mountain gives visitors access to a panoramic view of the Okanagan Valley, which is beautiful both day and night. To protect the endangered ecosystem of dry grasslands this provincial park was established as a conservation area in 2001. At night the vast sky is painted with stars, making Mount Kobau one of the best stargazing sites in Canada. At the summit the sky is an uninterrupted canvas for starry nights. An annual stargazing event is held on the mountain summit every summer. There is a rough road through open pine forests and fields of desert flowers that ends in a parking lot close to the summit. From the parking lot walking trails meander around the mountain; an additional kilometre of established trail leads to the summit. Bighorn sheep and sagebrush find protection here, but the park is also home to some of Canada’s smaller treasures. Look closely at the lichen coating trees and rocks and you may spot species that are new to scientists. One of the most impressive animals of the area is the Brewer’s sparrow, a desert-adapted bird that can live for a week or more without a drink of water. These birds are dependant on the sagebrush for nesting habitat and materials, as well as a place to eat and sleep. Although not technically in the protected area, Kliluk Lake, sometimes referred to as Spotted Lake, can be seen from the summit and is worth a closer look. During the summer much of the water in the lake evaporates. The mineral-rich lakebed is left with different coloured pools, which give the lake a unique spotted pattern. The lake was an important place of healing to the Okanagan First Nations. Excerpted with permission from 100 Nature Hot Spots in British Columbia: The Best Parks, Conservation Areas and Wild Places by Lyndsay Fraser and Christina Smyth, published by Firefly Books Ltd. / Copyright © 2018 Firefly Books Ltd.
Lyndsay Fraser is the curator and content developer of environmental education programs and exhibits at Science World British Columbia in Vancouver. She is a writer and content advisor for K-12 student and teacher resources on British Columbia’s natural history and environmental education. Christina Smyth is a secondary school science teacher from Princeton, B.C. She has worked as an interpretive naturalist and outdoor educator and is published in the Journal of Experimental Marine Biology for her work with marine isopods.